If you can’t walk on your hands specifically, here are a couple exercises that are handstand walk substitutions. They require much less balance then walking out in the open, but still train the same muscles and support ability needed. #1 – Walk laterally in a handstand across a wall. Here is an example. 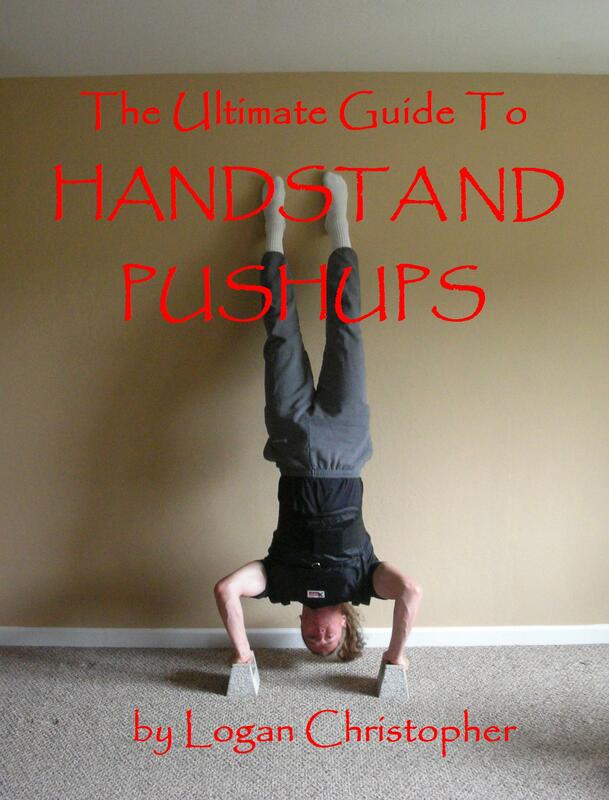 #2 – Walk vertically up into a handstand and down from a pushup position. Both these are great exercises most people can do, even if they haven’t learned how to balance in a handstand yet. If you don’t have the strength to support yourself in these positions yet, you can also do animal movements, which take some of the weight onto the hands which will build up your ability until you can support yourself. I’m often asked about handwalking in the many questions that come in. Usually it comes in two types; how do you hand walk, and what to do next? Let’s talk about the first part. First a warning. I’ve said this many times before and will continue to say it. You must learn to stand on your hands first, before you start walking around. The reason for this is that if you learn to walk and never to stand, you will only be able to balance by walking around and never learn the necessary wrist and shoulder balance necessary for all other hand balancing. Assuming you can stand, walking should pose no problem. Simply lift one arm up slightly, place in a little in front of where it was, repeat with the other arm, and continue on. In the beginning, strive to make small steps to stay in control. As you improve you can lengthen your stride. With this you’ll be spending more and more time on a single arm, thus making hand walking harder to do. The thing you want to strive for at all times is to stay in control. Just about anyone can stumble around on their hands for a few seconds. Even someone proficient in doing handstands may be able to walk on their hands but lose control the last few steps as they over balance beyond their ability. Now let’s tackle the second part. After you’ve done some handwalking what do you do next. Here is a list of different things you can do. As was already mentioned work on lengthening your stride. Work on going for distance. This is especially fun to challenge someone else in. Walk and stop. This method really increases your control and is further detailed in this Handstand Walking article. Vary the speed of your steps. Try hand walking faster and slower then normal. Walking forward is easy. Try handwalking to the sides and to the rear. And of course make turns, doing pirouettes on your hands. Try slapping while walking on your hands. Take the free hand and touch it to your head, shoulder, or hip with each step. (Each one of these is more difficult then the last). Can you dance on your hands? Sure, if you’ve got the skill and the rhythm. Handwalking is normally done with a regular position of the body. But there is no reason you can shift that around to add to the fun. And of course you can combine many of these. Try going for distance, quickly, while slapping your hip with each step. For tons more details on all these and more, including stair walking and jumping, be sure to check out Walking and Jumping on Your Hands, one of the books only available in the Hand Balancing Mastery Course. This should give you tons of ideas on where you can take your hand walking skills. In fact, I’m going to be working on some of these tonight at my gymnastics class.